Picture Provided by Crane Co.
With roots dating back to 1907, SEMCOR has been a partner to manufacturers and businesses throughout the Midwest for more than a century. Our customers count on us to deliver high-quality products for all their fluid and material handling needs as well as expert support that helps position them for success. We are proud to offer a comprehensive inventory of fluoropolymer (PTFE)-lined pipe and fittings. Our location in St. Louis makes it easy to fulfill orders for clients throughout Missouri, Illinois, Indiana, Kentucky and Iowa. We also have extensive fabrication capabilities and can modify any off-the-shelf plastic-lined pipe or related product to solve the specific challenges faced by your business. Keep reading to learn more or contact our office directly for assistance from one of our team members. PTFE is one of the most versatile materials used for lined pipe and fittings. It is near-universally chemically resistant and capable of withstanding temperatures as high as 450°F (230°C), making it ideal for handling nitric acid, oleum, nitrobenzene and other fluids used in industrial and manufacturing processes. Choose a PTFE pipe fitting for pharmaceutical, food and beverage, and other applications where performance can’t be sacrificed in the name of cost savings. For more information about potential applications of our PTFE-lined pipe fittings, contact SEMCOR directly. SEMCOR carries PTFE-lined pipe and fittings by Resistoflex®, a leading brand whose products set the standard for reliability and performance. Through this partnerships, we are able to offer our clients a comprehensive selection of PTFE lined pipe and fittings in a wide range of sizes and configurations. Our long working relationship with Resistoflex® means we know their products as well as anyone else, and we can ensure you get the lined pipe and fittings you need to get the job done right. 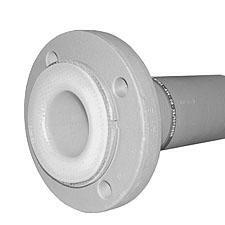 When an off-the-shelf solution won’t do, we can customize an existing PTFE-lined fitting or other product to your specifications. We pride ourselves on the problem-solving abilities of our sales engineers. Get in touch to discuss to your needs and discover how we can help you meet them. Follow the links on this page to learn more about our brands and our products. Ready to get started? Let us supply you with the right product for your industry and your application. For detailed information about our complete lineup of Resistoflex products, contact a SEMCOR representative directly by phone or email.